Ron Galunas, who delivers newspapers, said he likes to read outside after work. With warm weather nearly (if not quite) here, New Yorkers are taking to social media to share their al fresco summer reads. With its relatively quiet and ample green space, Central Park might be a New York bookworm's destination of choice, but decent reading nooks can be found in all corners of the city. Here, Instagram user Tony Killeen takes in the wisdom of Diane von Furstenberg at Rockaway Beach. Laura Beltran-Rubio dove into Daisy Goodwin's novel "The Fortune Hunter" on a memorable Memorial Day weekend at the Cloisters. A Sylvia Plath acolyte finds man-eating inspiration in McCarren Park. If you look closely, this Yankees fan is reading a Shakespeare history play on the subway. Is he headed once more unto the breach? Down on Coney Island, an herbalist hones his or her craft. Over on the Staten Island Ferry, fantasy fan Casey Read peeks out from behind "The Chronicles of Thomas Covenant." 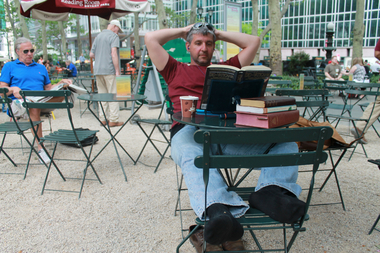 Where's your favorite place to read in New York City?